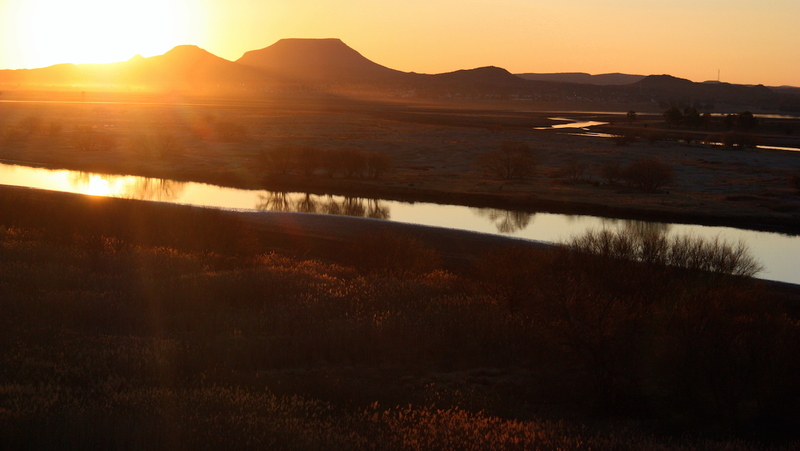 A popular but incorrect belief about the Orange River is that it was named after the supposedly orange color of its water. Too bad that isn’t true because it would be an awesome sight if the water was the color orange. Orange River in southern Africa is one of the longest rivers on the continent and one of the longest south of the Tropic of Capricorn. The It rises in the Lesotho Highlands, less than 125 miles from the Indian Ocean and flows to the Atlantic Ocean in a generally westerly direction for some 1,300 miles. Called the Groot River, when the first white man crossed it near the river mouth in 1760. The river was later named the Orange River by Colonel Robert Gordon, commander of the Dutch East India Company garrison at Cape Town, on a trip to the interior in 1779. Throughout the 19th century, the Orange River marked the northern limit of British power in southern Africa. Beginning in the 1830s, the Boers crossed it in search of land and freedom from British rule; they named their first republic—the Orange Free State—for the river. Since the end of apartheid, the name “Gariep” has had greater favour in official correspondence in South Africa, although the name “Orange” has greater international recognition.